Jim Beam is all about quantity over quality? 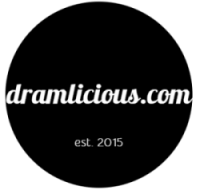 Well, you’ve probably never had one of their small batch bourbons then! Booker Noe, grandson of the legend himself, Jim Beam, created The Small Batch Collection, a “group of ultra-premium bourbon whiskies handcrafted in limited quantities from unique recipes, some dating back two centuries”: Basil Hayden’s, Knob Creek, Baker’s and Booker’s. Booker Noe originally introduced his own signature bourbon as a holiday gift for his family members and friends, and it wasn’t until later when his bourbon was made available to the public as well. 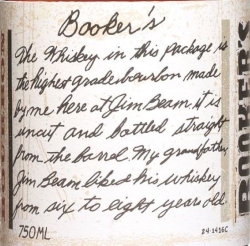 In fact, Booker was the one who introduced the world to small batch bourbon by coining the term. (…) reaching Booker’s standards is a mix of art, science and Mother Nature. It tells us when it’s ready, and then we’ll let you know. Inspired by a 200-year-old tradition, every batch of Booker’s is bottled uncut and unfiltered. Unsurprisingly, the super high strength is clearly notable. Lots of oak. Vanilla sorbet and caramel sauce. Soft and fruity sweet apple wood smoke. Strong and oily. It burns. A lot. Then it burns some more until some toasted oak comes to light, followed by cacao, caramel syrup and cinnamon. Long. Sweet and warming. A bit of oak, but without the bitterness. Powerful, raw and challenging. A truly unique bourbon!